Nine-year-old Gage Cave and 12-year-old Kaden Cave stand with more than 200 pounds of food they donated for the 4-H Barn Stompers Club on Monday in the Student Life Office. NORTH EAST, Md. – There is a continual need of the student food pantry at Cecil College, and members of the 4-H Barn Stompers Club of Cecil County came to the aid this week with a large donation. The Barn Stompers held a food drive this month to tackle food insecurity within the county. Hearing of the need of Cecil College students, the club delivered more than 200 pounds of food to the Cecil College Food Pantry on Monday. Among the donations were cans of Spam, tuna fish, ready-to-eat soups, and much more. “We heard there were people in the county that did not have anything to eat. 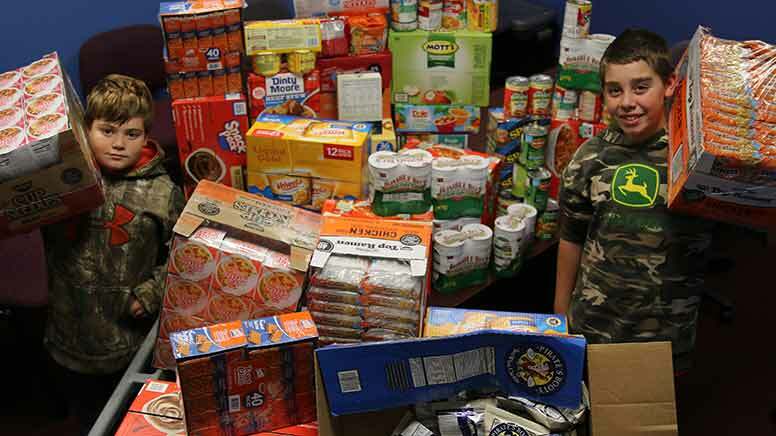 We felt that we needed to do something to help,” said 12-year-old Kaden Cave, who delivered the food to the North East Campus of Cecil College with his brother, nine-year-old Gage Cave. The Barn Stompers raise money by cleaning stables at Fair Hills Stables in addition to other fundraisers. Part of this money was used to purchase more food. Donations can be dropped off in the Veterans Library or Student Life Office (Room 114, Technology Center) on the North East Campus, as well as at Elkton Station.